GA derivatives point in a novel direction, because they target the integrity or assembly of the IKK complex. The structure of the ten-amino-acid NBD peptide might be used for a rational design of small chemical compounds that interfere with IKK formation. Many other potentially dynamic protein complexes are transmitting stimulus specific pathways to IKK activation. A serious obstacle to pharmacological interference with protein-protein interactions in scaffolding complexes is that, unlike enzymatic active sites, protein interfaces are often large and lack deeper indentations, which impedes effective binding of small inhibitory compounds (Berg 2003). Therefore, detailed structural information is needed to identify compact and centralized protein regions contributing key interactions that are in particular suitable for pharmacological intervention. Especially, resolving the structures of regulatory ubiquitin chains bound to UBD proteins could give novel hints for a pharmacologically relevant protein-protein interaction. Further, much more attention should be given to pharmacological inhibitors of ubiquitin ligases such as TRAF6. 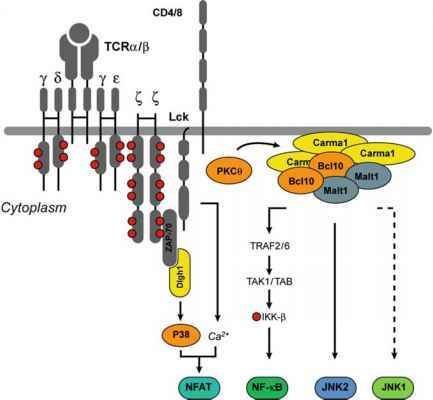 Even though these compounds target enzymatic activities, the blockade would disturb regulatory ubiquitination and thereby the generation of platforms for the recruitment of protein kinases. Finally, numerous negative regulatory feedback pathways exist that lead to the disruption of protein complexes, as for instance the CBM complex after T-cell activation. Activation of these cell-intrinsic negative regulatory mechanisms may in fact be more effective than the blockade of positive activating processes.